Roads in Moray were open today following last night’s snowfall which resulted in difficult conditions for some drivers. Although all routes were passable, motorists were urged to take extra care because of slush and surface water left over from yesterday’s snowstorm. 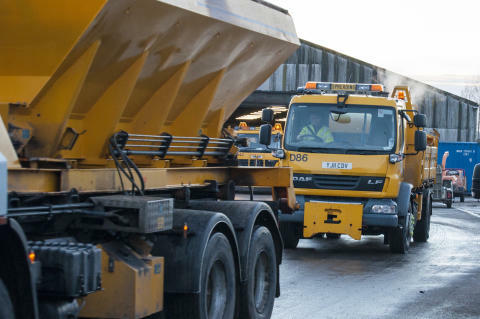 A Moray Council spokesman said the council’s fleet of 18 gritters were out ploughing and gritting roads across Moray during yesterday evening and were mobilised again early this morning, although milder conditions had seen much of the snow disappear overnight. The head of direct services, Stephen Cooper, said: “We’re sorry that some drivers experienced difficulty yesterday evening. “A number of the council’s gritters were deployed throughout yesterday and in the afternoon around Elgin. Roads were not all open and clear this morning. The Dallas to Knockando road was neither ploughed nor gritted this morning. I set off from the top at 0745 hrs managing to get to ScotAckleys before grinding to a halt in a large drift - its now difficult to tell depth since the council removed all the snow poles when improving the drainage ditches. I managed eventually to get it reversed out and decided to await the plough, to no avail, by 0830 a large 4x4 managed to plough through the drifts at several attempts and i JUST managed to get through. I was late for work. This is a priority 1 route. Not acceptable conditions considering Elgin had NO SNOW this morning. Why werent ploughs diverted to outlying higher roads? Sue Chadderton - a slight correction to your comment: Elgin did have snow this morning, not all parts of the town are as low lying as the town centre. The snow where I live did not clear and is still there tonight. Not that that makes much of a difference to what you wrote as the council rarely clear this area, and certainly never with any urgency as it is purely residential. So it still wasn't because the gritters were here that your road wasn't cleared this morning. To the council I would say this. I find it incredible that in this area, that rarely conforms reliably to any met office forecast, gritting schedules rely on one single 24hr forecast. To get anything useable I have to check for changes and updates throughout the day during weather events such as this, and - I look out of the window. If the surrounding skies start looking dodgy and the temperature reads low then I know there might be trouble ahead, and I prepare, regardless of what the forecast said six hours ago. The road situation yesterday was apalling, there should be no need for motorists to face vans coming down the hill sideways, and other vehicles having to give up on their attempts to get out of town that way. The other road leading out in the same direction was apparently shovelled clear by seven people to relieve the gridlock that had developed on a junction. I am not sure that the council can wipe their hands of this one. If the roads had been gritted at the start of the event or just before, there wouldn't have been nearly that many problems. For once the met office forecast was pretty accurate and this snowfall was predicted for days ahead. If you did not see this coming in your forecast then it might be wise to add other forecasting services to your arsenal. The weather started turning well before rush hour. Grit under the snow would have prevented it from being compacted into ice and would have turned it into slush instead I would have thought. It might need another application later as the slush and water will wash away the grit but surely that way the events yesterday could have been largely prevented or at least been made less chaotic. Personally I don't buy your version of events, dear council. You could have done better with more sensible planning and saved a few car drivers from damaging their vehicles and some scary moments. People were out, working, at school, whatever, and it was your job to facilitate them getting home safely. It worked well enough for other councils. But then, who am I to say. I think you have somewhat unfairly represented the forecast that you have shown in this. Nowhere does it say that any band of snow will be "light" - the band that is discussed arriving - albeit during the late evening - is described as 'heavy'. And it clearly states that prior to this expected band, wintry showers will continue in the west of the network - Elgin appears to be in the west of your area of responsibility. So snow was still forecast to be a threat during rush hour, and you quite rightly describe the operational difficulties of dealing with settling snow when the roads are busy. 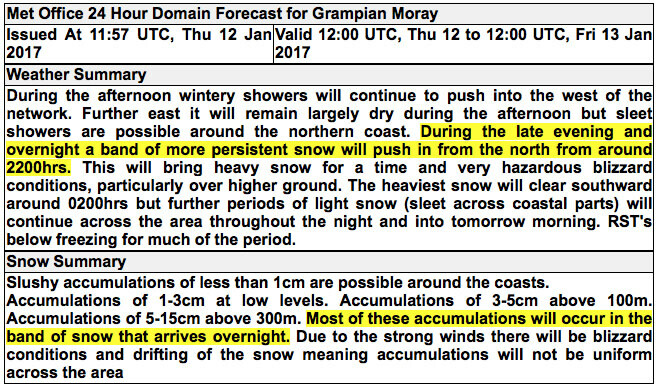 Snow forecasting is notoriously difficult in this country, was no one at Moray's winter road service monitoring the precipitation radar to see how the showers were behaving, or whether the band of heavier snow arrived earlier than anticipated?